1. Email your artwork or company logo to us. Preferred formats are AI (Adobe Illustrator), EPS or PDF. If you aren't sure what format your logo is in, just email us what you have. Our design team is pretty good at working magic in this area! 2. 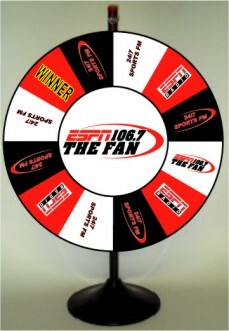 Decide how many pies or sections you would like on your prize wheel, colors, and what you would like in the sections - numbers, text, images, etc. Just tell us how you envision your wheel. This will give us a good starting point for your initial proof. 3. When you email your logo be sure to including your complete contact information (your name, company name, address, phone, fax, & email). We'll have your initial proof back to you for your review within 24 hours. We will have your estimate back to you the same day. Turnaround time to onsite delivery is usually 2 weeks after your approval of the artwork and payment is received. 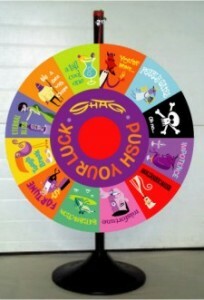 All prize wheels are paid in full when customer approves the artwork. Payment can be made with company check, Visa or Master Card. Questions? Call: 208-739-6278 or email..
Staff on duty to answer any questions you may have, 8AM – 6PM, PST, Mon- Sat.